After years in the military, Wulfgang Marrok has had enough. He wants nothing more than to settle down into quiet normalcy and live out his life. Unfortunately, the moment he meets his music history professor, "normal" and "quiet" disintegrate beneath a sudden metaphysical connection he didn’t think was possible. His mother is a werewolf, but he didn’t inherit her abilities… until now. 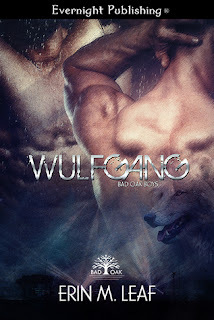 Wulfgang is the third book in the Bad Oak Boys by Erin M. Leaf. This series should be read in order to fully understand it. There is a ton of pack dynamics in this book, and references to past story lines you really need to know to fully grasp this book. Silas is the drummer for the Bad Oak Boys Band. He is also a professor of music history. He likes being a professor and goes to great lengths to make sure no one recognizes who he really is. He needs a break from the pack, and drama of life in a band. He thinks he can get it being a small town professor. Little does he know his mate is in this town, and with that will come the biggest pack political challenges he has ever known. Wulfgang has just returned from the service. He is human like Silas or so both of them think. He gets hassled by the local kids he grew up with. He does keep an even temper about himself. He has an air of an alpha long before he ever will become one in this book. There is a TON of story inside this book. From pack politics, to learning how to be a werewolf, to just interpersonal relations. I will say Ms. Leaf does a great job of making me engaged and wanting to read more even with a ton going on. This is the most complicated out of the books in the series thus far. I found it also one of the most enjoyable reads. There is tons we need to know for the future as well. I really love this series and cannot wait to see where Ms. Leaf takes it next. I know there will be lots of love, music, and great action ahead.